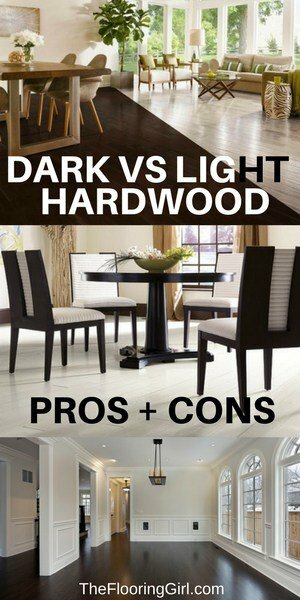 What are the pros and cons with dark hardwood floors vs light hardwood floors? Hold up a white index card over half of this to shift from light to dark hardwood floors. There are several other examples throughout this article. Which do you prefer – dark or light wood? Thankfully, when it comes to hardwood floors, there is no one-size-fits-all. Some people prefer light woods and some people prefer dark woods. What’s right for your friend may not be right for you or your home. And, if it’s your house, you get to choose. No floor is perfect. There are trade-offs and only you can decide which factors are most important to you and your family. What do you like, what do you prefer? What is the style of your home? What is the style of your decor? Do you have a busy household? Do you have pets? How often do you clean? How particular are you when it comes to dirt showing? What are the sizes of the rooms? How much light do you get? What colors are the walls (and/or will you be changing the paint color)? What goes best with your furniture? What color are your cabinets goes best with them? Which hardwood floor stain colors are most in style? 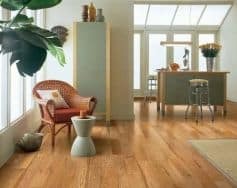 Here in Westchester County and the NYC metro area, dark hardwood floors have been trending the last several years and continue to grow in popularity. These are followed by light floors (primarily natural i.e. no stain.). You can read more about hardwood floor stain color trends in this article. But, just because dark is in, it may not necessarily be the best choice for you. There are pros and cons to both light and dark hardwoods, so read on. 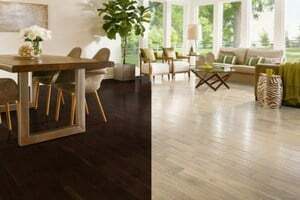 Is it easier to keep dark or light hardwood clean? Light hardwood floors have a distinct advantage here. They tend to show less dirt than dark hardwood floors. But, if you love love love dark wood, go for a dark color that is slightly lighter (e.g. choose jacobean rather than ebony, or dark walnut over jacobean). Also, choose a satin finish as this shows dirt, scratches, dents and imperfections less, regardless of stain color (it’s also more stylish). And, of course, there is always the option to clean more and remove your shoes at the door. Both of these actions will also help you preserve your hardwood floors longer, too. By the way, when it comes to hardwood floor cleaner we recommend Bona Hardwood Floor Cleaner . You can buy Bona directly on Amazon, if you like. Which shows scratches more – dark or light hardwood? 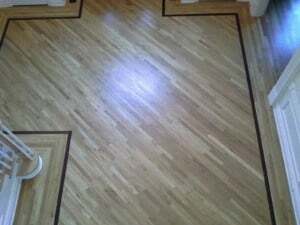 All hardwood dents and scratches, but dark hardwood tends to show the scratches more. The primary reason for this is that most wood floor species are light and if you scratch through the dark colored stain, it shows more of a contrast with the wood underneath vs. a lighter colored floor. But here’s a good maintenance solution – Screen and Recoat once every 3 to 4 years. This will give your floors an extra coat of poly and help your floors last longer. You can read more about Screening (or buffing) here. Plan B – What to do if you have a scratch? This is not a perfect solution, but consider buying a Minwax stain marker. It can help camouflage your scratches, especially if you only have a few. It comes in many colors including ebony, dark walnut, red mahogany, golden oak, provincial and cherry. Some people will even get 2 similar colors (e.g. ebony and dark walnut) as there is color variation in the wood. Which shades of wood are best if you have dogs? Because light hardwood floors show scratches less, they are generally better if you have dogs (and/or a busy household). If you are staining your floors dark, you may want to consider adding an extra coat of polyurethane so that they last longer. Will dark floors make my home look smaller? Will it be too dark? Dark floors do you make your space a bit smaller and light floors make the space look a bit larger. However, it is really the combo of colors on the floors and walls that give the total impression, and there is more wall space than floor space. Dark floors tend to work better in larger homes and homes with larger rooms and open floor plans. If you prefer dark floors and are concerned that your space will look too dark, consider going lighter in the painting and consider adding overhead lighting (or more light). Lighter window treatments and window treatments that show more windows also help as does getting a front door with glass. If you are going dark, how dark should you go? This really is a matter of taste. The most popular is currently jacobean (which is the 2nd darkest color). Generally, the darkest you go is ebony. Sometimes ebony is not a dark as some people expect, so there is an option to do a “water pop” which darkens it a bit further (or aniline dye which gets it even darker). Because dark shows the dirt more, I’m finding that many are opting for a 50/50 blend of ebony and jacobean. It’s a bit darker than jacobean, and a bit warmer than ebony (but still in the cool tone family). If you’re looking to go super dark, you can try Duraseal’s new True Black. It’s even darker than ebony and it’s more opaque. It hides virtually all of the oak graining (Note: these floors are challenging to maintain as they show every bit of dirt). To the right, you can see Duraseal True Black (#199). And, below, you can see a stain test showing True black (left) vs Ebony (right). If you’re looking to buy the True Black stain, you can purchase it online at Amazon buy following above link or clicking on the picture of the can. It’s not available in most stores yet. Dark Walnut is slightly lighter than jacobean and if you feel jacobean is still too dark for your tastes, give this a try. Then, just slightly lighter are antique brown and coffee brown. Everyone’s definition of dark is different and for many these colors are dark enough. Bear in mind that the stain colors will vary a bit based on the species of wood you have (e.g. red oak vs. white oak…white oak is a bit darker) and grade of wood (lower grades have more color variation i.e. more darker boards, so these come out a bit darker). Obviously, the lighting of your home can have an impact on how dark the floors look. Also, over time as wood ages, it gets a bit darker too. The same stain can easily look different in different houses, so it’s best to test it on your floors before committing to the exact stain color. And, there is color variation among the planks. All the more reason to see the stain in a larger area over several planks. Also, I want to note that if you have other species such as yellow pine or Douglas Fir, the stains and graining will look different than they do on oak. These species start out a different color and absorb stain differently. Oddly enough, for example, I’ve often found that ebony is often not the darkest stain on these woods. So, test test test. If you’re selecting a pre-finished hardwood floor, you’ll want to pick out the sample that works best for your floor. It’s ideal to see the samples in your own home and lighting as they do look different there vs. the store. (lighting has a huge impact). And, you will want to look at the sample vs. your furniture, cabinets and paint colors. Finally, I do want to mention that often the pictures online look a bit darker than the wood does in real life. I know I’ve seen this optical illusion and I’ve had some customers ask how they get the floors even darker (as they show me an online picture). Some species are naturally darker and some absorb the darker stains better. If you are refinishing your existing floors, remember that you can’t change the wood you already have (well unless you plan on replacing it). 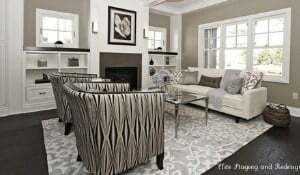 For more info and pictures of dark hardwood floors, check out this article. If you are going light, how light should it be? Again, this is a matter of preference. Most that are going light select natural (as many like the natural color of the wood). Natural tends to hold up better (vs. a stain) and it tends to dry faster. 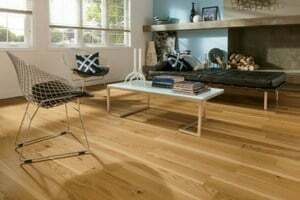 There are options to use a water borne poly to make the floors lighter or even use a white wash. You can read more about light and blonde hardwood floors here. Which hardwood stain colors are most modern? 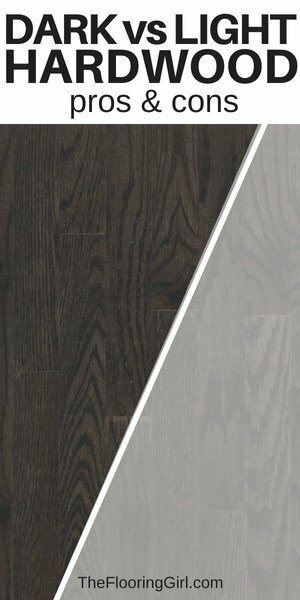 Which costs more – dark or light hardwood floors? This depends on whether you are doing pre-finished or refinishing existing floors. If you are installing pre-finished floors, the cost is usually the same for all colors on a board. However, prices can vary based on species as well as brand and sub-line selected. If you are refinishing existing hardwood floors, generally natural is less expensive than a stain. And, if you are upgrading to white wash or gray stains, the prices will be a bit more (both due to stain/process and type of polyurethane use. We strongly recommend Bona Traffic HD for gray or white washed floors. Impact of pre-finished vs site finished wood when it comes to stain color? If you are refinishing existing floors, the world is your oyster. Just choose your desired stain color (and test it). If however, you are installing pre-finished hardwood floors, be careful about the micro-bevel edges. Site finished floors are smoothed out and the stain penetrates all areas. But, pre-finished wood (or factory finished) have beveled edges and often the edges will show lines where the stain has not penetrated (and you can see the underlying wood color underneath). This is not always apparent on the samples (as some samples only show one piece) and as you are looking at them up close. When they are installed on the floor, and you view them at a standing height, you notice these more. And, you notice them much more on darker floors as there is a large contrast in colors. If you are choosing natural, these are barely noticeable. So check this out carefully. Which color goes best with your furniture? Believe it or not, this is much less of an issue than most realize. Most wood floors go with most furniture. The reason is that the wood is neutral. Also, many people have different types of furniture in different rooms and even multiple wood colors and species in most rooms. In general, most dark wood floors and most light wood floors go with most furniture. The tricky part is generally if you have red toned or mahogany furniture. These generally go better with brown toned floors – and often either very dark or very light. You don’t want to have floors with red tones as they may compete with with your furniture and you want the floors to complement the furniture. Also, don’t forget that you can add area rugs to help unify areas and make the colors more cohesive. If you look at the pictures throughout this article, you’ll see that a variety of furniture colors and styles work with the floors. Which color goes best with your kitchen cabinets? If you have hardwood in the kitchen, you’ll want to consider the color of the cabinets. If you have white cabinets, virtually any hardwood color will go. If you have a wood colored cabinet, you’ll want to select a color with a nice contrast. Generally, darker floors look better with lighter cabinets and lighter floors look better with darker cabinets. And, be sure not to mix and match reds as these usually do not work out right. If you are having challenges making this combo work consider refacing, replacing or painting cabinets (even if done later) and/or consider the more extreme colors of very dark, very light, white washed or gray hardwood floors. If your floor is old and has a bunch of imperfections (e.g. gaps in floor, water stains, knots), darker stains will cover this up better. Darker stains will camouflages stains better and the shadows of the gaps (which sometimes is due to normal expansion/contraction and other times from the wood drying out a bit after exposure for 80-100 years). Of course, if your flooring is damaged or has holes, new wood can usually be woven in for a repair, especially if it’s a small area. Which has higher resale value – dark or light floor? Inherent in this question is which option gives you the higher ROI (return on investment)? Don’t forget, there are 2 parts to the equation – the numerator shows the preference, and the denominator looks at the cost. The overall trend/preference right now is very dark stains followed by very light (i.e. natural). And, in general reds are less popular – they are polarizing, so if you are looking to sell, I would stay away from them. However, it’s not quite as simple as that. You really need to look at the style of the home to see what works best (e.g. is your home traditional of contemporary?) and there often is more than one answer. In most of the Tudors, for example, dark hardwood floors tends to look best (and buyers looking at those homes prefer darker floors). In some contemporary homes, either very dark or very light looks best…and this may depend on the style of decor. Because lighter makes your space look larger, natural can be a great option for smaller homes and condos/co-ops and town houses, especially those with less light. On the other hand, if your floors have a lot of imperfections or stains, a darker stain may make your floors look better. If you have existing hardwood, then usually it’s less expensive to refinish natural (i.e. light) rather than use a stain. And, it usually dries faster, so it makes the process easier. For these reasons (price, ease and making space look larger), many will opt for natural, unless it looks out of place for the style of the home. Check out these 2 videos for more design inspiration on dark and light hardwood floors. Some of these floors are stunning. Which do you prefer – light or dark hardwood? Both dark and light floors work very well, and only you can choose which is best for you and your home. Dark floors tend to be more stylish and hide imperfections while light floors tend to show dirt less and last longer. Your decision may vary based on whether you are staying in your home or planning to sell in the next few years. Importantly, both dark and light hardwood floors are great options. Oil vs. Water based polyurethane – Which is better for refinishing hardwood floors? How to prevent scratches in your new hardwood floors. I sent this great article to my client who has been complaining about her new house she built and decided to put dark wood floors and has two dogs…. “..I wish I would have read this article before I built my house…” L.
Hi Endre. It’s great to hear from you. I hope your client found the info helpful. Thanks so much for stopping by and commenting. I see absolutely no advantage to having dark wood floors! They show dust, dirt, crumbs, scratches, and most importantly, It makes your room much darker!! Different people have different tastes. You definitely have noted some drawbacks, but they can be overcome. Regarding making your space look smaller, it all depends. The room will look much smaller if you have light floors and dark walls rather than dark walls and light walls. Most prefer to contrast colors on floors and walls. (and yes, you could go light on both. Also, you can make room look larger with a light area rug. Joy – You are not alone in that feeling. Lighter floors are definitely easier to maintain. Great article. I learned a lot but I’m still stuck. I have a condo that overlooks the bay and gets tons and tons of light, almost too much. I had to tone down the walls, doors and casework just to not have to wear sunglasses indoors during the summer. I love the wide plank, dark look but also have Espresso furniture and it might be too much. I also might get a lot of glare from the dark color…. so it sounds like I am leaning towards lighter than darker? Thanks. Michael – I hope this helped. By the way, if there is too much glare, I’d look into window treatments for sure. It will help with glare as well as AC bills. I was lucky to read this literally as I’m in the process of having the boards in my living room sanded down and tidied up. I had thought of going for a dark stain, but the combination of reading this and seeing the boards in their newly sanded (and light) condition has persuaded me to keep them that way. Hi Jack. I’m so glad to hear that this was helpful. And, yes once you see them sanded down, it can make a big difference in visualizing. I hope your project turns out spectacular. 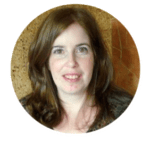 Hi Debbie – thank you so much for this wonderful website! We are just about ready to start a huge reno project at our home. It involves taking down a wall to make it a kitchen/dining room/living room combo in a small ranch house. We are also replacing the flooring with new hardwood floor throughout all rooms. My husband likes dark cabinets, I like dark floors. Can you recommend your favorite dark color combos for kitchen cabinets and hardwood floors, as I think we are both colorblind (cool? warm? huh?) …. appreciate any advice! Hi Fran. Thanks so much for your kind words. That means the world to me. I would go for cool colors as they tend to be more in style and a bit more neutral (and tend to work better with stainless steel appliances and hardware for the cabinets). Personally, I think my favorite is dark hardwood + white cabinets. You could also try gray cabinets w/ dark floors. I see some doing dark cabinets and natural floors with Bona Traffic (as this tones down the yellow and gives more contrast). For dark, most here are doing combos of ebony/jacobean or ebony/dark walnut. But, you’ll need to test to see what you like. I hope that helps. Hello, this was a very helpful review. We have made our floors dark but now the built ins, which are dark do not stand out. They look bad. What do you suggest? Hi Denis – Maybe paint the built-ins white. I can’t see your place, but in general white cabinets and white built-ins and white cabinets go well with dark floors. I hope that helps. I have dark grey kitchen CABINETS WITH BLONDE WOOD FLOORS AND STAINless steel app. 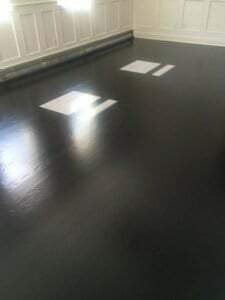 I wat to change my floor color to ebony. I have dark grey kitchen cabinets with blonde wood floors. The appliances are stainless steel. Would you change the floor to a dark wood? Trudy – I think that depends on how dark you want your home and how much light you have. It would be a nice and striking color combo, but it just may be too dark for your kitchen. BTW, I’ve seen a few homes where they have ebony/dark in main living areas and then contrast with white wash in kitchen. So, I might consider that. I am redoing my floors due to a water issues. also, I have two dogs. Thank you for your prompt reply! Regarding the colors you recommend…are these available for engineered wood? Sara – Yes, and no. Sorry…I made the mistaken assumption that you were refinishing the floors and had solid hardwood. I was tired. Sorry for jumping to conclusions. These are stain colors/finishes I told you. Often you can find similar items in engineered wood, but they won’t be called that…they each have unique names, so you have to do this visually. Also, there is an option to buy unfinished engineered wood, but this will be much more expensive. And, if you have engineered wood, I’d probably go light, since most can’t be refinished and the dog may (over time) scratch up…and same w/ the people. If you can do solid, I would do that. But, if you have a concrete subfloor, I understand that this may not be in the budget. No problem! I appreciate your prompt responses. I currently do not have any hardwood flooring. Due to the water issue, I am replacing existing carpet in living areas and bedrooms and the laminate wood look flooring in the kitchen. My biggest dilemma is deciding on the wood look tile? or engineered wood floors? and what to put where. What are your thoughts on the wood look tile? If you have concrete subfloor, I’d do porcelain wood look tile for kitchen. I have redwood flooring at the moment and getting ready to sand and stain. I’m leaning towards 50//50 ebony and classic grey. Have you seen this combo o. Floors? And if yes, does it look nice? Veronica – I don’t know what redwood flooring is/what you mean. Do you mean it has a red stain? Or do you mean it’s a red species? If the former, the current color won’t matter as it will be sanded off. If the later, that is a big deal. If it’s brazilian cherry or american cherry or douglas fir, it will look very different and have red undertones and you would want to test the stains, and most likely use different one than you are planning (e.g. dark walnut rather than ebony as that will come out darker on the red wood and nix the classic gray as it’s way too watery and instead use Bona white and ebony (so 3 colors). I hope that helps. Oh, and yes, if it’s white oak, your combo can look nice, but it would probably come out a bit better with duraseal ebony + bona white. That will be thicker than the watery classic gray (see my article on gray hardwood flooring). If it’s red oak, you may need to go a bit darker to drown out the pink tones (i.e. shift the ratio). We are needing to update our kitchen floor. We are looking at a wood look laminate in gray. The problem is that it butts up against our breakfast nook which has brown Bruce oak flooring. We don’t really want to replace the Bruce but don’t want it to look mismatched. Any suggestions? I actually think that gray is a good solution as it looks different enough from the brown. Also, either now or later, you could refinish your Bruce floors (assuming they are solid) to a darker/cooler toned brown (e.g. ebony/dark walnut blend) so it goes even better with the gray. Thank you! The Bruce is very textured so we are not sure it would refinish well. After looking at more samples today I agree with what you said that the different color will be enough to to not look bad. One more question. Do you suggest the planks running in the same direction as the Bruce or the opposite direction? Tammy – Right, the sanding would remove the texture. If you’re changing the color, I don’t think it matters so much. I would do whichever looks best for the space (and is easiest). Since it’s a floating floor, there’s no technical advantage to either way. From an aesthetics point of view, it’s generally better to have the wood go in the longest direction. (But, sometimes in a kitchen w/ cabinets/appliances, the longest length may look wacky in some layouts…but try to have it go the longest direction. The other factor is the transition to adjoining wood. If it’s same direction, you will just have the transition over 1 piece of laminate and that is probably better (and easier, too). I recognize that this may give you conflicting info, but these are the thinks I consider. Since your wood is floating, it may wobble if your subfloor isn’t even so just having the transition over 1 piece is probably better. What an awesome blog. We have grey walls and are sanding/finishing wood floors. 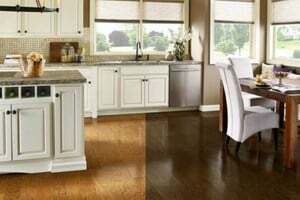 If we wanted light “blond” floors, which stain color would you recommend? Also, is the satin finish the most popular at this time? Thanks so much for your help. Kay – Thanks so much. If you want light, I would not recommend using a stain at all – go natural. It will be lighter, more in style and last longer. Plus, it will be less expensive. Yes, satin is most popular and most practical (shows dents/scratches/dirt less). Thanks for the great articles. Very helpful. I am refinishing the steps in our old Victorian house. Our floors are wood parquet with an amber tone (not orange thank god). I am thinking of using either a Bona Dri-fast stain or a Bona craft oil, or perhaps another wood oil. Do you suggest one over the other? If I use the Bona craft oil will it need to dry for a few days? If I use the stain, is there a color you can recommend? I would like to go darker but in the same tone as the floor. The steps are white oak. Do you have any recommendations for Bona Dri-fast colors for houses from the late 1800s? Something that would go well with the amber parquet floors? Do they have sample jars for testing? Haven’t made it to the closest place in Brooklyn that sells Bona products. Thanks so much. Regarding color, that is hard for me to say…it’s not about when the house was built, but rather what stain color you have on the rest of the floor and I can’t see what you have. 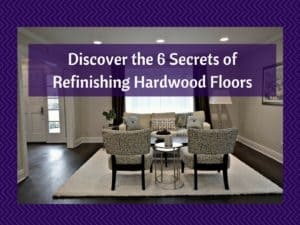 But, this article https://theflooringgirl.com/blog/hardwood-flooring-stain-color-trends.html This shows the stain colors (you may need to scroll down) and then see which color(s) are closest to what you have and you probably want to test them. You’ll have to get “testers” at the store (i.e. smaller versions). Based on your description, it may be a color around golden oak, but you’ll need to look at the colors. I’m just guessing. I love how you lay out the options for dark and light and then address individual comments and give suggestions. You clearly know your subject matter. I wish there were someone like you in the DC metro area to help with these big choices! Lise – Thanks so much. I really appreciate it. Yes, there are pros and cons for each, so the homeowner needs to decide which factors are most important to them. I have cherry wood cabinets in my kitchen that have darkened with time as they are 20 years old. Originally, they were also stained with a dark red stain. The flooring is maple and I’m wondering if I should keep it natural with no additional color added. Initially I thought adding a bit of color would enhance the cabinetry but after reading your other comments and suggestions believe keeping it natural would be best. I am trying to avoid any yellow in the look. Nancy – Yes, I would leave it natural for sure. You want to have as much contrast as you can. If you add a stain, it will make the place look darker and cabinets will look duller. I would do natural with Bona Traffic (that will look best, last longer and amberize less than any other option). Whatever you do, don’t use oil based poly on that. It will turn yellow and look more and more yellow over time. Plus, a stain on maple will turn out blotchy (and ironically, it will cost you more). In our kitchen, we have medium cherry cabinets (reddish tone) and dark uba tuba granite. Our current floor is a light maple, but we have to replace them. Here’s my dilemma – both my husband I love dark floors but I don’t want our kitchen to look like a cave. Also the wood floors would be echoed in our living room too. Any ideas? We have 2 dogs and kids. Allie – Oh gosh, that is tough since your kitchen is already dark. But, it’s kind of like the “tail wagging the dog” if you sacrifice your preferred flooring color. Natural maple is the lightest you can go. Natural oak might also work, but will be darker than current. But, here are some other options: 1) go dark and get a light area rug for kitchen (if it works with lay out)…see first if you like it all dark before buying the area rug or 2) maybe go dark dark in rest of house and do white in the kitchen for a nice dramatic contrast. Alternatively go light by doing natural with bona traffic in kitchen. (And, I’m guessing you’re happy with the cherry cabinets and don’t want to paint them white…obviously if you paint the cabinets white, everything will work. But, if you have lovely cherry cabinets that you love, that may not be the best move). Hi flooringgirl. Would you suggest refinishing my existing orange/yellow hardwood floors to a darker color? I’m trying to give my 22 years old home a more updated look. Can’t make my mind up on stain color. Mimi – Yes, going dark will give it a new and a modern look. It’s super stylish. No matter what you do, do something to avoid orange/yellow color as that is super dated. Hi flooringgirl. It’s Mimi again, and thanks for your previous help. I have another question? My home was built in 1996. The contractor poured gypcrete under all of my floors. The downstairs is all oak hardwood. Downstairs bedroom is carpeted. The entire upstairs is carpeted also. Gypcrete, i’ve heard, was used by many contractors at that time. Will it create a problem when I add hardwoods to the downstairs bedroom, and upstairs? I also will be refinishing the flooring downstairs, but I don’t think it will be a problem there since the hardwoods will not be removed. Therefore, do you think the gypcrete can stay, or will it have to be taken out? Worried about the cost for that, because I feel like it’s already going to cost a fortune! Thank you. Mimi – for downstairs, where you already have hardwood, you can refinish it and it should be fine (assuming it’s solid hardwood). Upstairs, if you are installing solid hardwood, you will need to first install a plywood subfloor, and that will cost extra, but there is no way around that. The contractor should be able to install plywood there, but may need to use hilties for proper installation (and that is more expensive)…or if it’s in bad condition, may need to remove it. You need to have a solid base install the wood. You should get a local contractor to take a look (and rip up a section of carpet) to give you a better idea of what’s needed. Sometimes, it’s very flakey and not a good surface to install on. If you do engineered hardwood there, you don’t need to worry about plywood subfloor, but you do need to worry about subfloor that’s currently there and whether it’s flat/smooth as well as level. That could impact the wood you use and floor prep and whether or not it needs to be removed/replaced. You’ll need to have a local professional take a look to see condition in those areas. we have golden oak kitchen cabinets, baseboards, and a lot of golden oak furniture. Home is 30 years old so does not have super high ceiling and not a lot of natural light. Should we use lighter wood instead of darker wood in our house? I don’t want the house to look smaller. I would probably go natural, so your space doesn’t look smaller. Alternatively, consider painting cabinets and/or doing light paint on walls (if you have a darker paint and do dark floors. If you’re not going to change either of these, stick with light. 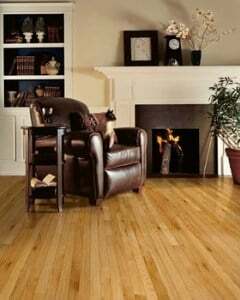 We have laminate snap lock flooring in our great room. Can we lay vinyl planking snap lock over the existing floor? Also my walls are knotty pine with orange/honey coloring and I am wondering if a lighter flooring with some gray and woodtone hues would look good or should we go with a darker color. Please and thank you! Noralee – I’d highly highly recommend that remove the laminate flooring before installing another floating floor. Otherwise, you are installing a potentially flimsy and movable base. And, if your current laminate moves (from regular walking), your new boards may pop and separate. Regarding the color, you are probably better going on the lighter side as the paneling makes the room darker. You’ll have to look at the colors together to see how they work together. Knotty pine also has a lot going on, so you probably want flooring with less graining/movement so they don’t compete against each other. We have a large 2 story condo with high ceilings. It has light oak woodwork everywhere including kitchen cupboards . I love the look of medium to dark floors for the entire main floor and steps up to the next floor. What color would you advise? Rae – I think you should do what you love. I’d also strongly consider painting the trim and/or cupboards white as it will give you a more updated look…and then dark will look even better. Everything is a judgment call. You can go lighter on the walls if you prefer darker hardwood. That’s what most people are doing now. In terms of shades, most are doing dark walnut, jacobean, ebony or blending two of those. My fave is 50/50 dark walnut/ebony. What do you think of combination of medium cherry cabinents and medium gray maple floors? We can’t change our cabinets and I’m looking for an darker alternative than natural maple. Thank you! Your articles are so helpful. Allison – To be honest, I don’t love that color combo. If you like it, go for it. If your plan is to do that now (because you love the gray) and paint the cabinets later (e.g. white), it’s a pretty good plan. If not, I might just do a darker brown. (BTW, I think the gray with the maple is awesome…it’s the cherry that makes things difficult). I hope that helps. This is just my opinion. Hi. We are redoing our bedroom from scratch, All we have in the room now are white closet cabinets and the bed which is mid century style with splayed legs, rust orange headboard and dark wood frame. We are having a hard time picking the paint color and floor. Our bedroom has 2 small windows on a very high wall. The room is never bright – SW orientation. We wanted to paint that big wall in gray but, every shade we’ve tried takes on a blue undertone. Question: the room itself is pretty small, what would you suggest in the way of floor and walls combo? Thank you so much in advance. It’s probably extra challenging given your headboard. Also, if all the grays are taking on blue tones, it could be due to the current shade of your wall…you may need to add a primer first if it’s shining through. for an accent wall, you can go darker and then go lighter on the other walls. You may need to try some grays with greenish undertones. Try Sherwin Williams Silverpointe for lighter color (and this will probably go with your headboard, too) and coordinating darker color for the accent wall such as Ellie Gray (or stamped concrete). I hope that helps. 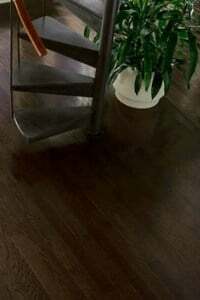 Hi I’m doing the entry hall all the way to the kitchen with grey porcelain tiles, can I put brown hardwood floors in the dining room and family room,I’m hesitant to put grey hardwood floors because then I’d had to stain my stairs grey too and I don’t know how it’s going to look. Maria – Absolutely. That combo of dark brown and gray works very well and I see it all the time. It works better when the stain colo is darker brown and cooler in tone (e.g. dark walnut or darker). It doesn’t look as good with mid brown or browns with red undertones. Dear Flooring Girl, thanks so much for your helpful blog. Everything you explained makes perfect sense. We have recently purchased a house in a nice location, but it’s got very awkward floors. 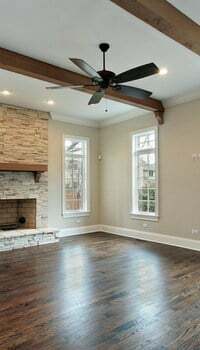 The dinning room is hardwood, the kitchen is title, some living area is title, and the main living area surrounding the fireplace and the hallways are carpet!! 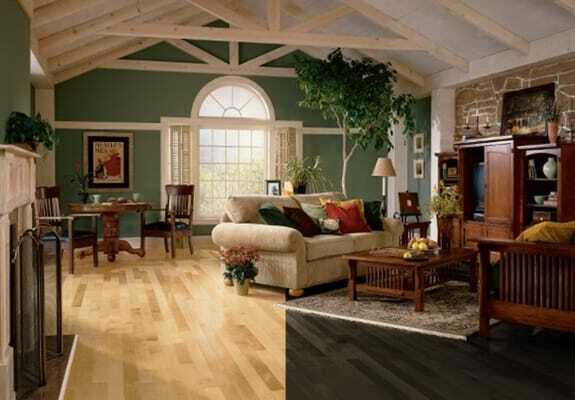 We want to make the kitchen, living room, hallway, and the master bedroom hardwood floor, and prefer dark colors. But the living room has an Austin Stone fireplace, stained mantle and bookcase (built-in). The kitchen cabinets are also mantle. I’m struggling picking up the right floor color. Or should I paint the bookcase and kitchen cabinet white? But the style of the kitchen cabinet is a bit traditional. Another option maybe just paint the built in book case white, and leave the tile in the kitchen, but make all other common areas wood? Thank you for your help in advance. Alice – First, thanks for your kind words. I agree that you should make things as uniform as possible, and for sure would convert as much as possible to hardwood…except for potentially the kitchen. 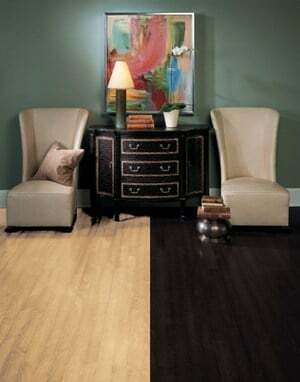 And, dark is great floor color choice (the most popular in NY area is 50/50 ebony/dark walnut blend. I think the color should be fine with Austin stone fireplace. I’m not sure I’m understanding the kitchen cabinets being mantel. Do you mean they are wood and stained the same color as the mantel and bookshelf? If so, what color are those? Anyway, it should be easy enough to paint (or stain) the mantel and/or bookshelf so that they go with the floor…and you definitely could paint them white to lighten up and modernize the place. For the cabinets, I would strongly consider painting them white…if you like them/want to keep them. White is most popular and will go with any floor choice…even if you decide to keep the tile. But, they will certainly work with all hardwood floor colors. Some of this may also be driven by your budget, but if you can do it all, i would do hardwood everywhere and paint cabinets white. Hi FlooringGirl, thank you so much for your prompt reply. This is Alice again. I wish I live in Westchester, NY. The built-in bookshelf and the kitchen cabinets have the wood-tone color, and won’t contrast the dark hardwood floor at all. I’m seriously considering paint them white and do the dark hard wood floor. But both cabinets and bookshelf are traditional style, particularly the cabinets (got some traditional details), and I’m not sure if white color can go well with it. My other option would be do tile all over the place which won’t give the color clash. Need your advice!!! Alice – I would paint as much as you can white. I would not do tiles everywhere. This will be hard on your feet as well as cold, and will look dated in 10 years. I could see doing tile in the kitchen. But, this is hard for me as I can’t see everything. Tom – Personally, I prefer a dark color with those…most people here are doing a 50/50 blend of ebony/dark walnut. But, if that’s too dark, I might try dark walnut or antique brown. I think going mid is probably the worst you can do with the gray, so I would either do very dark or very light…you need contrast with the cabinets. For very light, I would try natural (i.e. no stain) and use bona traffic HD for the poly. This will give you an updated/contemporary look and cut out the yellow. If you do natural with oil based poly, it will be yellow and amberize more over time and that doesn’t go so well with the gray (and it’s a dated look). Regardless, test the color…and make sure your wife is happy with it, too. Terrific blog! 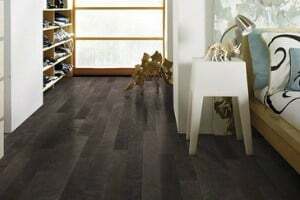 Am moving into an apartment that has brownish/maple-ish cabinetry but I get to choose new floor plankings. Would you go more brown/maple or taupe-grey-ish with a subtle distressed look? Space is only 300 sf, so I’d want it to look as light and airy as possible. Thank you. Bill – First, thank you. Second, oh gosh, this is a toughie because I can’t see it…and your definitions may be different than mine. In general, you want to contrast with the cabinets which either means going much lighter or much darker…and when the cabinet color is in the middle that is hard to do. I think going darker (or even same color) will look too dark, esp if it’s only 300sf. So, I’d be more inclined to go lighter…and maybe lighter than what you’re thinking. So, I might go natural with Bona Traffic finish…or a whitewash…if you can find one that looks right with your cabinets. But, I am not sure…as I can’t see it. Staci – Oh gosh, that is very challenging. Orange is so dated and it kind of glows or reflects so it makes everything else look orangy. Would you consider painting the doors/paneling and even cabinets white. That would make it easiest and then anything will go. Obviously, it’s a different style. Or, maybe you stain the wood dark. With orange, especially given your experience with the whites and grays, you may need to do a warmer yellower tone of tile (or a beige) for it to go. And, of course, that’s not as stylish and isn’t often made with wood look tile (because it’s just less popular). If it were me, I’d want to address the orange first. (even if you put down the floors first, at least select color for walls and neutralize them. We are updating our old 2 story house. I want to dark (wood look) floors in living room and kitchen. We have light oak cabinets in kitchen. Will it look ok to put in walnut interior doors? 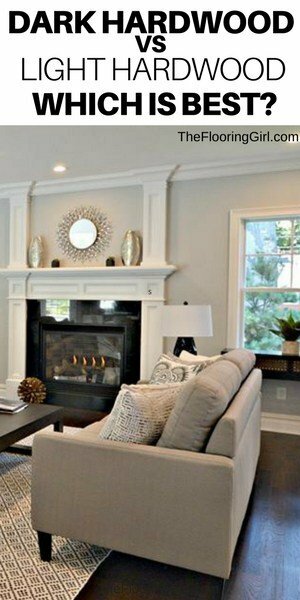 And dark trim with light colored walls. Darla – You could, but the dark doors may be too dark. White will make the space look lighter and still go well with the floors and cabinets. Your blog is so helpful for those of us with light versus dark dilemma. Here is my story and I wonder what you would advise. I am doing a kitchen remodel in an old colonial home in WI. I am installing grey cabinets( Sherwin Williams network grey), white subway tile backsplashes, light countertops, stainless steal appliances, and an accent brick wall ( trainstation faux brick by General Shale ). I envisioned this look with a light floor to give the kitchen an airy fresh appearance. My dilemma is the following: my dining room which adjoins the kitchen has an old red oak floor with the orange shellack finish. I installed the new red oak floor in the kitchen with a hope that if We sand done the old “orange” floor we will be able to create a seamless light floor look. Well it turns out the orange hues of the old floor seem to come out when we attempt a light finish. The new floor is toothed into the old floor and the only way to make the transition seamless is to go dark. We were advised duraseal spice brown with bona satin finish by the hardwood floor installer. My floors will be sanded on Wednesday and are scheduled for staining on Thursday. I am terrified of the dark floor – I am worried it will make my rather small space really dark and that my “airy” kitchen will turn into a dungeon. Is there any way to prevent the orange/Amber of the old wood to seep our? Or what do you think of the duraseal spice stain color in combination with grey cabinetry in a 10×11 galley style kitchen with two smaller windows? Adjoining dining and living rooms are bright on a sunny day but rather dark on a gloomy day. Thank you for any words of wisdom! Ula – Sorry about your dilemma. That is odd that you have orange coming through. Maybe it’s not red oak (or perhaps it’s not fully sanded). It sounds like something that may happen with a pine. If you want fully want to do get rid of the orange, you’d probably have to go darker. You can try spice brown, but a bit darker (e.g. antique brown) would cover it more (and probably look a bit better with your color choices. I’m just surprised by the orange after sanding. If you are getting that, in general, doing a lighter stain won’t work. If you want to go light, it sounds like you would need to bleach the floor first. From there, you can see if just going natural (no stain) or using Bona NordicSeal (see below). An alternative you could try if you want to go light, but not sure if it will work and it will cost more is to try Bona nordicseal. This is a tinted sealer – white tinted. You may need several coats to drown out the orange. Or you can try a combo. Not sure that these will work to cover up the color difference where you’ve woven in between old and new wood. Darker is certainly much easier to cover this up. You can read more about NordicSeal here. You can even see how it looks over red oak in the video. But, again, I’m very surprised by orange tones…normally on red oak, you have pink tones. Thank you so much for your quick reply. The spice brown does seem to cover up the transition well. My floor installer suggested a satin Bona Traffic finish. I could include photos but I don’t think it is possible here in the comments. My biggest fear is that dark floor will make the space really dark. Just had our oak floors refinished with a dark color, they came out beautiful ! Any tips? Thanx, great article ! Holly – So glad you’re loving your dark floors. The fading is really due to the sunlight. Different fabrics react differently, but I’m not an expert on them. you may want to look into some sort of window treatments and/or films for the windows. But pillows are really inexpensive, so my advice would be to go for it, and if they fade, just replace them. Pillows are a great way to update decor anyway…and without spending a fortune. I have blonde maple trim and base. Can I put dark walnut down on the floors or will this not match? Todd – I’m sorry, I’m not sure I’m understanding your question, so apologies ahead of time if this isn’t quite what you were looking for. Yes, you can use dark walnut stain on maple (or other dark stains for that matter) – both on the floors and the trim. Test it first as the stains come out different on oak and maple. And, you will need to apply a conditioner before the stain. If you have maple on both the floors and the base molding/trim, they should look the same/similar (could of course vary based on the quality of the sanding. If you have maple on one area and oak (or another species) for the 2nd area, that would not match. I hope I answered your question. Feel free to respond back if you meant something else. 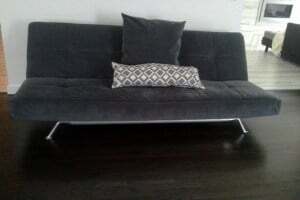 Doug – In general, it will look better and your space will look larger, if it’s the same. You can always refinish the others to match, if you want to as you may or may not be able to match it, pending on what it is.